2017 Event: The Fazl-i-Umar Mosque was recognised this year for displaying the American flag year round, and a plaque was awarded. 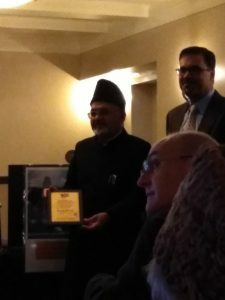 Imam Shamshad Nasir, regional Imam midwest, received the plaque from president Khadijah Ali and addressed the gathering on the subject of “Who we are as muslims and as Americans.” The Imam explained the meaning of Islam and muslims, and elaborated how true muslims are loyal to their country of residence. He also explained how peace cannot be attained without justice and the importance of acting justly for peace without personal interest. “Islam teaches us to sacrifice our rights for others,” he further explained. Talking about the history of the Ahmadiyya Community in Dayton, he surprised Exchangites by telling them that the Fazle Umar mosque being honored that day was the oldest in Ohio. 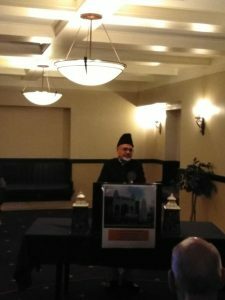 Dr. Shahid, president of the Ahmadiyya Muslim Community Dayton, and a member of the Exchange Club, talked about the history of the Ahmadiyya Community here that started in 1947. 2016 Event: This year we were privileged to honor James R. Arnett Jr., of the Orbit S&D/Osterfeld company. 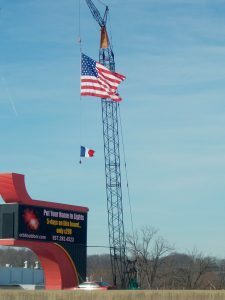 He received the Proudly We Hail Award for his spectacular display of our flag over I-75. Mr. Arnett and his wife were guests of the club. Not only has he flown our flag, but symbolically displayed the flags of nations that have been assaulted by ISIL extremists and has provided highly visible space for displaying the United Rehab Duck for the Duck Ragada. No symbol inspires respect and love of country more than our American flag — the Stars and Stripes. That is why Exchange encourages all Americans to properly fly the flag as an ongoing, highly visible expression of that respect through the Proudly We Hail program. Proudly We Hail honors those Americans who do display the nation’s banner. Recognition is in the form of a beautiful plaque specially designed for this purpose. Our 2009 Proudly We Hail honoree is Corporal Charles Baker who served in the U.S. Marines on Iwo Jima and knew one of the heroes who raised the American flag on Mount Suribachi, February 23, 1945. Of the 1666 men in his outfit who landed on Iwo Jima, only 177 men walked away! How fitting it is that he was our first recipient of the Proudly We Hail award at a special luncheon in his honor on Thursday, April 30, 11:45am., at Walnut Grove Country Club.